It's almost too good to be true - a day that celebrates Chocolate Candy? 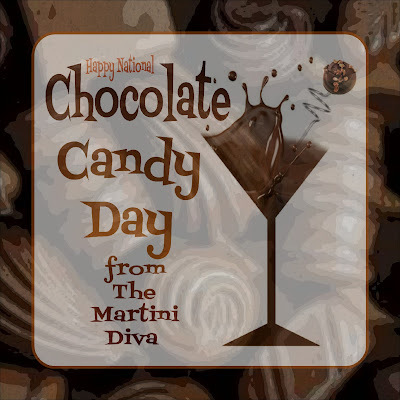 Yes, every December 28th is National Chocolate Candy Day. All Chocoholics may now rejoice! 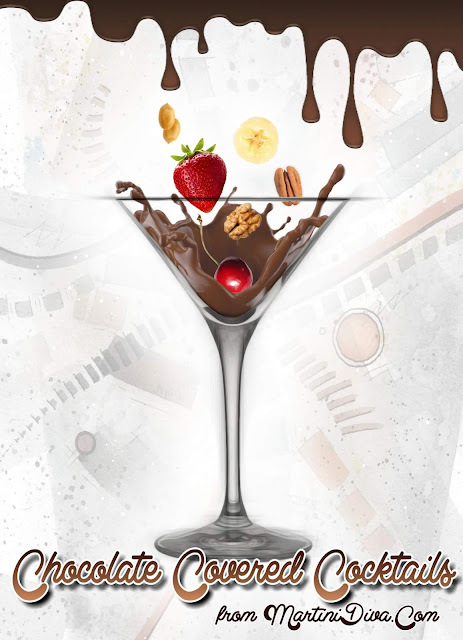 Of course, the best way to celebrate chocolate candy, in my opinion, is with a Chocolate Candy Cocktail - or two. Let the Endorphin Rush Begin! I want to THANK YOU ALL for supporting my small business stores and making this the best holiday ever for The Martini Diva Boutique and The PopArtDiva Gift Gallery as well as my other online stores. 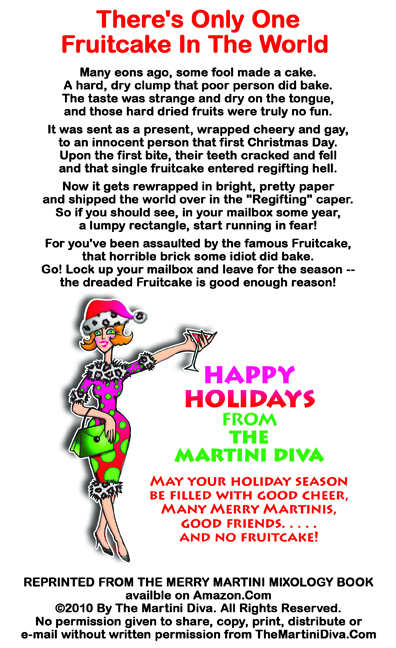 A big THANK YOU as well for all of you who purchased my books, The Merry Martini Mixology Book and The Martini Diva's Halloween Martinis & Munchies Book. Your orders have encouraged me to get on with the rest of my planned books and next up will be my VALENTINE MARTINIS & MUNCHIES BOOK coming in January, followed soon by two others that will be recipes for any and all occasions! I will be taking a little bit of a break after the first of the year to rest up from all the holiday tweeting, friending, blogging, creating and martini testing that starts way before Halloween and ends only after New Year's Eve. I'll still be enjoying all my Twitter tweeps and Facebook peeps and will still be blogging and cocktailing - just not at such a frantic pace!! 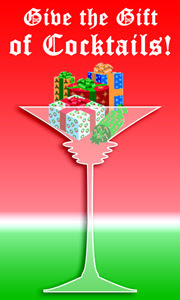 My New Year's Promise to you is many, many more Marvelous Martinis and Happy Hour HiJinks in 2012! Thank you all so much for your friendship and the fun. in voices sweet and bright. put the jolly in your night. with your stocking full of cheer. that is pleasant to the ear. throughout the whole New Year. "My Christmas Wish For You" ©2010 By PopArtDiva.Com. All Rights Reserved. Traditionally in England, the twelve days of Christmas are celebrated starting on Christmas Day or possibly even Boxing Day (aka St. Stephen's Day), the day after Christmas. Also know as Christmastide or Twelvetide, this Christmas celebration ends on January 5th and is then followed by the Feast of the Epiphany on January 6th. 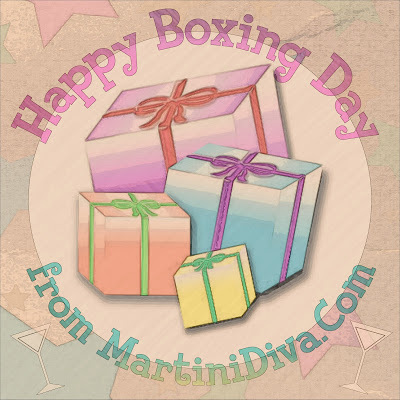 The Partridge In A Pear Martini is a perfect cocktail for the famous "Twelve Days of Christmas Song" and for Boxing Day. Made with fresh seasonal pear puree and garnished with a pear slice that looks remarkably like a partridge perched on your cocktail glass, this is a truly impressive cocktail to serve to your holiday guests or enjoy at happy hour. Happy NATIONAL HOT COCOA DAY! Also known as Hot Chocolate or Cafe au Chocolat, Hot Cocoa is a heated beverage typically consisting of shaved chocolate, melted chocolate or cocoa powder, heated milk or water, and sugar. 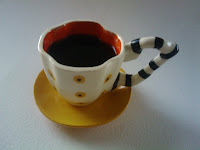 In my house it was made with hot cocoa where my mother would warm up sugar, cocoa powder, a little water and a pinch of salt to create a chocolate liqueur then slowly add the milk. Sometimes we got marshmallows, sometimes not. This is the way I still make my hot cocoa, unless I'm lazy and use instant. 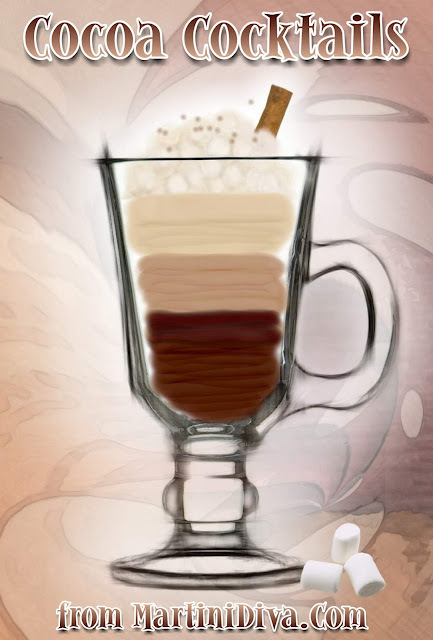 Enjoy your adult versions of Hot Cocoa. National Hot Cocoa Day is December 12th. Pinnacle Vodka was kind enough to send me a few samples of their large line up of flavored vodkas this week. It was like an early Christmas opening up the box and finding four lovely blue bottles of their flavored libations. They sent me the Cake, the Atomic Hots, The Gummy and the Whipped (cream) vodkas, fulfilling a nice little chunk of my Christmas Wish List in one box. I am not an expert on liquor but I do have quite a few years experience of creating and drinking martinis, and I have some culinary training, so when it comes to making a tasty cocktail, I have some fairly credible experience. Give me a decent vodka, rum, tequila, whiskey, gin or any other standard liquor and a well stocked fridge, spice rack and garden and I can (and have) come up with hundreds of unique and exciting cocktails for just about any palate or occasion! Up until lately I have not been tempted into adding many of these newer branded flavored vodkas to my bar. First, I do a lot of my own infusions and, second, I simply thought names like whipped, cake, purple and the like were just new marketing terms for simple one-flavor vodka infusions. I was wrong. I have to say I'm very pleasantly surprised by the samples Pinnacle sent me, they all had fairly complex flavor profiles, some definitely distinct aromas wafting up from the bottles (good nose), the equivalent of a decent vodka afterburn and the first sip of each was like similar to a cordial or sipping liqueur. These newer vodka infusions/flavors do remind me more of liqueurs than true vodka infusions as they are sweet and slightly sticky, unlike pure vodka or most simple flavor infusions. I won't get into the technical specifics here, I leave that to the chemical booze geeks, though I will tell you the alcohol volume on these vodkas is 35% as opposed to 40% for plain vodkas. The first thing that struck me with these particular flavors was the fact that you don't have to get overly complicated to create a tasty drink as the vodkas themselves have a fairly complex flavor profile on their own. The Whipped and the Cake in particular should make a variety of really nice martinis with the addition of one or two simple mixers and an interesting garnish. This makes these vodkas a wonderful addition to the neophyte bartender or home based cocktail enthusiast because it simplifies the act of making a cocktail and alleviates the danger of a failed flavor pairing. The nose is right there, it smells like yellow cake batter in the bowl. The flavor less so on the first hit, it has a little bitterness at first, but the then that cake flavor rests on your tongue after the vodka slides down with a very mild burn. You can sip this one just as it is and I will do that on the nights when I don't even have the energy to shake a cocktail. Pretty much the same as room temp but it seemed a bit sweeter with a little more bite. The burn is the same, but the aftertaste was actually a bit stronger chilled and then I got a nice little warm blast from the burn. I can work with this. Obviously for sweet martinis, but this will go nicely with fruits and berries, creams and some lovely spices. I might even toss a splash or two into a dessert sauce and maybe even in a savory sauce! This is a nice one for food pairings, especially desserts and fruit based appetizers. 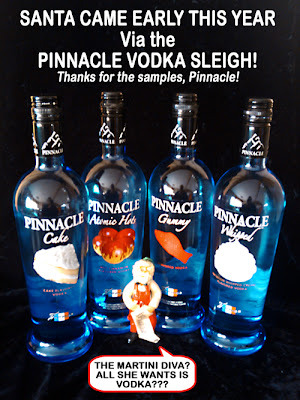 The Pinnacle CAKE Vodka can definitely take up room in my bar any day. Check out some of the cocktails I've created using Cake Vodka. This was my favorite of all of the four. The nose on this was a rich, buttery, almost caramel like aroma that made my mouth water - always a good thing as the nose is the first part of any cocktail experience. If I ever run out of my Madagascar Vanilla Extract I will be using the Pinnacle Whipped as a substitute! (What? You didn't know most flavor extracts contained alcohol???) I think this is a tad bit sweeter than the cake, nicely warms your mouth with a rich buttery element, has a bit of a burn going down and less of an aftertaste than the cake. You can definitely sip this one right out of the bottle at room temp and be pretty darn content without having to go to any work unless you want to pour it into a shot glass. Not only that, try pairing this with a shot of espresso like I did - Whee Doggies! I don't know how Pinnacle did it but they got that "cream" experience in a non-creamy liquor so you can save some calories by not adding dairy! The nose was a little more subdued chilled than cold and the buttery element also, though the caramel profile came through nice and clear. As as sipper I would prefer this one room temp. The interesting thing was a bit of a chocolate back taste on this just before I swallowed but I think that might have come from the creamy quality which remains in the chilled Whipped vodka. I think the possibilities with the Whipped are almost endless. Already I have a couple of martini recipes using it with coffee and I can see this added a great deal of depth to most cocktail recipes calling for vanilla vodka. 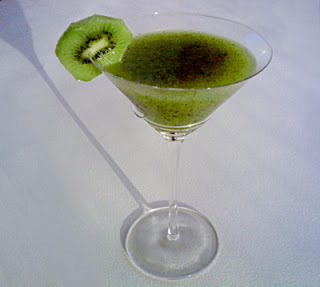 It will go with all fruits, creams, most spices as well as blend nicely with other liqueurs. I'm already thinking how nice it will work with my Candied Pecan Liqueur, my homemade Pumpkin Liqueur to name a couple. It will rock the Casbah with whiskey (think a Whipped Irish Coffee) and will play nicely with rum as well as other flavored vodkas. I'm going to try it out in several of my recipes that call for plain vanilla vodka like my Key Lime Pie Martini and others. I'm definitely going to serve this as a cordial with flan or crème brûlée, in fact anything with caramel would work with this. Overall I think this is the most versatile of the four samples I received and I won't let my bar stand empty of it from this point on. Check out some of the cocktails I've created using Whipped Cream Vodka. Yup, this smells and tastes pretty close to the original red Swedish Fish candies. To me there was a definite fruit flavor but I can't really say raspberry though this is what came to mind in the nose. It's said the Swedish Fish are flavored with Lingonberries though there's no confirmation of that. It's been so long since I've actually had a Lingonberry I can't tell you if that is in the Gummy or not. Not my cup of tea as a sipper, but it was a mild burn going down. This was the flavor that lingered on my palate the longest of the four, there was no bitter aftertaste but I had to cleanse my palate to get the taste out. Interesting, both the nose AND the flavor were stronger chilled. In fact, chilling improves the Gummy for me tremendously. Still leaves a very strong aftertaste on the tongue but the burn was still mild. I'm a little flummoxed about the Gummy one for mixers unless you go with plain sodas, citrus fruits or maybe raspberries or other berries. I won't be blending it with creams or herbs, though some spices like nutmeg and cardamom could be interesting. This will be a fun challenge for my mixology skills! My first thought when I smelled this was to pair it with licorice (I have no idea why unless I just related it to Twizzlers, lol) which I'm definitely going to try just out of curiosity. I'm just not sure exactly what food pairings I could do with this one. I'll have to get back to you on that one. Here's a fun cocktail I created using the Gummy Vodka: Gummy Worm Cocktail Gels in Primordial Booze! First, I have to be honest and say I'm not overly fond of Cinnamon flavored booze on it's own. I like cinnamon itself as a spice and I use cinnamon liqueurs like a spice - a little bit to pop up other flavor profiles. I have been known to take a small flask of Hot Damn to outdoor events in the winter because it's warming but that's about the extent of it as a sipper for me. That being said I'm replacing the Hot Damn with Pinnacle's Atomic Hots immediately as my go-to toe, tummy and finger warmer this winter. It's just plain better tasting, not as syrupy and not as candy like. It's probably not fair to compare a flavored vodka to a schnapps but, let's face it, in a small flask the higher alcohol volume wins the day and Atomic Hots is 35% while Hot Damn is only 15%, there's just more tingle to warm my jingles! Yes, Goldschlager has a higher alcohol content (43.5%) than Atomic Hot but frankly, despite all the glitter from the gold flakes, it doesn't have half the flavor. Pretty much the same as room temp but with a little more bite and a tad bit more alcohol taste. I like it better warm and that's how I'd serve it as a sipper. Works better that way as a toe, finger & tummy warmer too. I think the Atomic Hot is going to have a fairly decent range of mixability. Obviously, it's going to blend nicely with apple vodkas and puckers but I can see it warming up a nice glass of whiskey and rum as well and a little splash in hot cocoa or apple cider. A small splash of it could work nicely to replace powdered cinnamon as well. 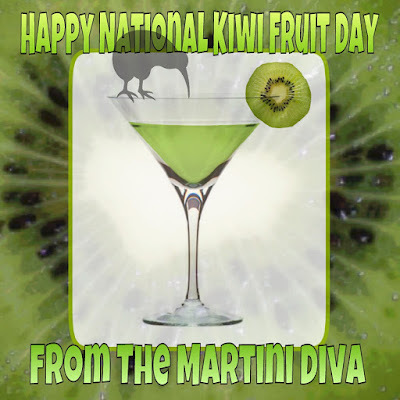 I'll be adding it this week to my Fall Apple Jack Martini as replacing the Goldschlagger in my Millionaire Martini. The Atomic Hot reminds me very much of those cinnamon oil soaked toothpicks from my youth and, yes, the atomic fireball jawbreakers of broken tooth fame. This would pair well with apple pies and cobblers, peach too, in fact, anything you use cinnamon in so some rice pilafs would work well paired with this. Definitely worth taking up space in my bar, especially in the winter! 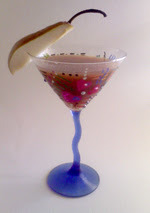 Here's a delicious cocktail I created using the Atomic Hots Vodka: Apple Sauce Cake Martini. All in all, I have to give Pinnacle 5 Martini Glasses for these four vodkas. They did an excellent job of capturing the flavors they were going for and they created some decent booze in the process. My thanks for the samples, I will be happily experimenting with all of these in the upcoming weeks and months so keep an eye out for my recipes. In the meantime, see what Pinnacle itself suggests as recipes here on their recipes page. And P.S. Pinnacle, thanks for my early Christmas present and (hint, hint) my birthday is next month and I'd love to try out and review your Chocolate Whipped, Cherry Whipped, Orange Whipped, Espresso ...oh, heck, any other of your flavors you'd like to share with me!! 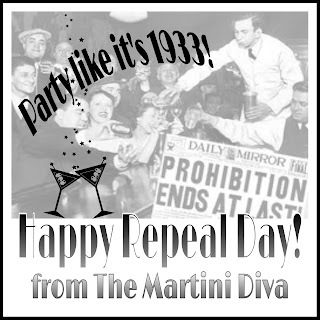 Today we celebrate the ratification of the Twenty-First Amendment to the Constitution aka the repeal of Prohibition. This revoked the Eighteenth Amendment and ended a 13 year ban on the sale and distribution of alcohol in the United States between the years of 1919 to 1933. The Eighteenth Amendment essentially took the business licenses away from every brewer, distiller, vintner, wholesaler and retailer of alcoholic beverages in the United States while the Volstead Act (otherwise known as the National Prohibition Act) gave the “Commissioner of Internal Revenue, his assistants, agents, and inspectors” the power to enforce the 18th Amendment. Of all the cocktails that you can now legally drink, today is a perfect day to enjoy some Gin Cocktails because gin (or rather "bathtub" gin) was the true darling of the era of illegal alcohol and speakeasies. Gin became synonymous with prohibition for one reason, it did not require the aging of whiskey which had been the more popular liquor in the U.S. prior to the ban on alcohol. Gin could be, and was, brewed in all manner of slap-dash distilleries - including bathtubs! - thus prohibition ushered in the era of bathtub gin and gin joints and the Gin Martini became the godfather of cocktails! National Repeal Day was instituted by Jeffrey Morgenthaler in the mid-2000s, who said if there's any day to celebrate alcohol this is the one and I wholeheartedly agree. I don't know if he's done it yet, but I suggest he petition the White House to make this a national holiday. 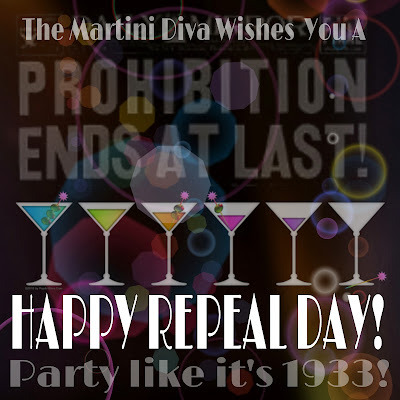 Prohibition was sometimes referred to as "the noble experiment"
The Eighteenth Amendment did not ban the use of possession of alcohol for personal use as long as the spirits did not leave the house or get distributed outside the home. Alcohol was also still available via a physician's prescription. Churches and the clergy were also provided a provision for the use of wine as a holy sacrament. The term "Speakeasy" for the illegal saloons that operated during Prohibition, comes from the practice of advising drinkers "speak quietly" or "speak easy" about an unlicensed saloon in public, or when inside it, so as not to alert the police and neighbors. The term "The Real McCoy" comes out of the Prohibition Era: Captain William S. McCoy, who facilitated most of the rum running during prohibition via ships from the Caribbean to Florida, was said to never water down his imports thus making his rum "the real thing" aka "the real McCoy". If you're anything like me you have a gift list for Christmas that's a mile long and a bank account that's about half a mile short! To solve my holiday gift giving insolvency I make a lot of my gifts. In the days before I became The Martini Diva I did what a lot of people do and made cookies, but being the "Normal Challenged Artist" that I am I had to do them a little differently. I made what I call my Pop Art Diva Cookies and gave those out to a large part of my list. People loved them but they are a ton of work and I just don't have the time to make them anymore. When I started doing vodka and liqueur infusions and publishing articles on them I realized I had the perfect, easy replacement for the now famous "Pop Art Diva Cookies", home made liqueurs and infusions. I also make a lot of my own cocktail rimmers and salts and these are ideal are gifts by themselves or in tandem with a homemade liqueur! As several of the liquor infusions take some time to distill you want to get on them soon. If you start your infusions right now they will all be ready just in time for your holiday gifting or for your own holiday parties! You will want to get some pretty, decorative bottles for your creations, some ribbons and some customizable holiday labels for them, read my articles, gather your ingredients and tools and then you're ready to start brewing away for the holidays! 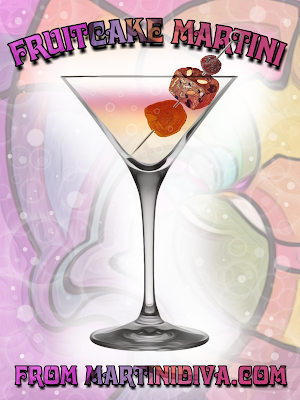 Here are my recipes for several popular liqueurs, flavored salts & sugars and my special Candied Nutz recipe as well. All of these make wonderful, tasty and original Christmas and holiday gifts for friends, family, neighbors and co-workers. Make a few extra for hostess gifts and spares for the person(s) you forgot to put on your original gift list!! Pair any of these gifts up with some of my fun & colorful gifts from The PopArtDiva Gift Gallery or The Martini Diva Boutique for a really special, one-of-a-kind holiday gift to remember!